Lameness and leg problems can occur from time to time in poultry and there are a variety of reasons that these can occur. Start off by catching the bird as quickly and calmly as possible. A catching net can really help in large areas but the corner of a run can be used to catch a bird quickly, especially if there are two people to do this. Examine the legs, and feet to establish whether there has been any sort of injury due to an accident that has caused damage to a birds legs. Look for cuts and / or bleeding. Open wounds need similar treatment to cuts we might sustain. Bleeding needs to be stopped by applying sterile bandage or dressing and larger cuts may need antibiotics prescribed by your vet to combat bacterial infection (see Cuts and Wounds for further advice) although the legs have restricted blood flow so don’t usually bleed severely. Inspect nails, ensuring they aren’t too long, causing discomfort. 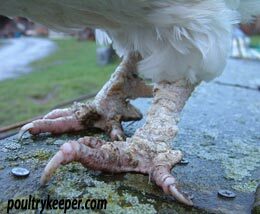 Nails usually aren’t ever a problem for free range chickens as they are worn down naturally. Battery Chickens usually require their nails trimming when they come out of the cage. This can be done with dog nail clippers, just make sure you don’t cut them too far back where there is a blood vessel. Trimming a little at a time is normally the safest. If there are no obvious injuries to the legs, examine the bottom of the foot. A cut on the pad / bottom of the foot can cause Staphylococcus bacteria to infect the foot and the pad to swell, causing lameness. This swollen pad is normally called Bumblefoot. When squeezed, there can be puss coming out of it. A heavy landing from high perches (low perches are better for heavy breeds such as Orpingtons, Wyandottes or Jersey Giants) or rough perches but basically anything that can cause a splinter in the foot can cause Bumblefoot so make sure there are no sharp splinters anywhere that are likely to cause problems for your chickens. In ducks and geese, staphylococcus infection can occur in the leg and foot. 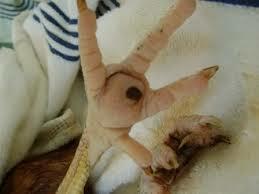 This results in a swelling that feels hot to touch and causes the bird to limp, hold it’s leg or go off its feet. Staphylococcus infection occurs in the tendon sheaths, so it can take a long time to heal (this is because tendons have very little blood supply). It seems to affect young geese more than adults. To prevent this, ensure birds have clean, short grass to graze and there are no sharp objects or gaps where a leg could be trapped and cause a cut or sprain. Supply a pelleted feed to make sure birds are well fed and are receiving sufficient vitamins and minerals. If a bird is limping, restrict the use of the leg by restricting the area it has available and try to provide clean water deep enough for swimming that is easy to get in and out of to help the recovery process. Cooling the leg down repeatedly can help tendons to recover. An antibiotic injection from your vet can be required. This is better administered sooner rather than later. Vets will usually use Amoxicillin, a broad spectrum antibiotic. Working up from the feet, legs and hock joint should be examined. If they feel hot and look swollen and / or are painful to touch, it could be caused by Mycoplasma synoviae which can sometimes be serious. It is best to visit your vet so that they may examine the bird and provide a course of antibiotics (often Tylan) if appropriate. Scales on the legs should be smooth. If scales are raised, this can be due to a burrowing mite (Knemidocoptes mutans) or better known as Scaly Leg Mite these should not be picked off, however they look. A treatment of dipping the cleaned legs into surgical spirits weekly for a month is usually recommended by vets to try to kill the mites, followed by covering the legs with Vaseline which will soften the scales and suffocate the mites in between surgical spirit treatments. It will take many months before the scales drop off and are regrown. Scales are replaced, just like feathers but you must wait for this to happen naturally and not pull scales off. Ivermectin drops can also be used to kill scaly leg mites and is often seen as an easy to use solution but these are not licensed for use on food-producing animals such as chickens so should therefore only be used when prescribed by your vet, who will also advise a suitable withdrawal period for your eggs. 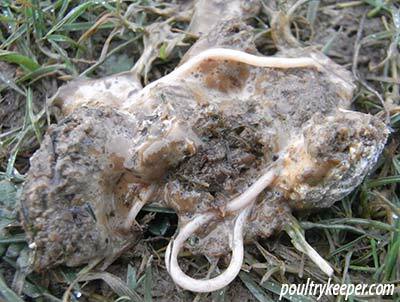 Worms can cause poultry (especially waterfowl) to go off their feet although it isn’t that common for this to happen. Geese pick up worms more often than ducks, especially if their pasture is well used. Routine worming with Flubenvet should prevent this being a problem. See Worming Ducks and Geese for further information. Pasteurella (Fowl cholera) can cause waterfowl to go off their feet. This is normally identified by green droppings, lack of appetite and increased thirst. It is caused by a bacterial infection so can normally be cleared by a short course of antibiotics such as Tylan, prescribed by your vet.